Oh my! I’m having so much fun with this bird. This is our current Mystery Class, Tall Bird on a Rock by zecca. Today was the second class and it is really coming to life with texture. Look at that hair. Well, yes, I know its feathers but really, check it out. I wanted something wild and fluffy and just the perfect shade of green. Here it is! And then I stitched his head using a brand new shade of Color Dreams Floche. LOVE! His chest is a combination of two fun laid filling stitches. The stitch on his chest compliments the stitch on his neck and the stitch in the background. It’s a plan, you see. They were all selected to harmonize. These leaves are my absolute favorite part of the canvas! River Silks 4mm ribbon works it’s magic and I’m in love. Karen from zecca calls them Super-de-duper! What more could I ask for. 🙂 And I promise they are easy peasy. Put that laying tool away! It’s not for these leaves. And the stems are just ribbon lightly twisted and tacked in place. EASY and fun. Stay tuned tomorrow and I’ll post a how to video on the leaves. 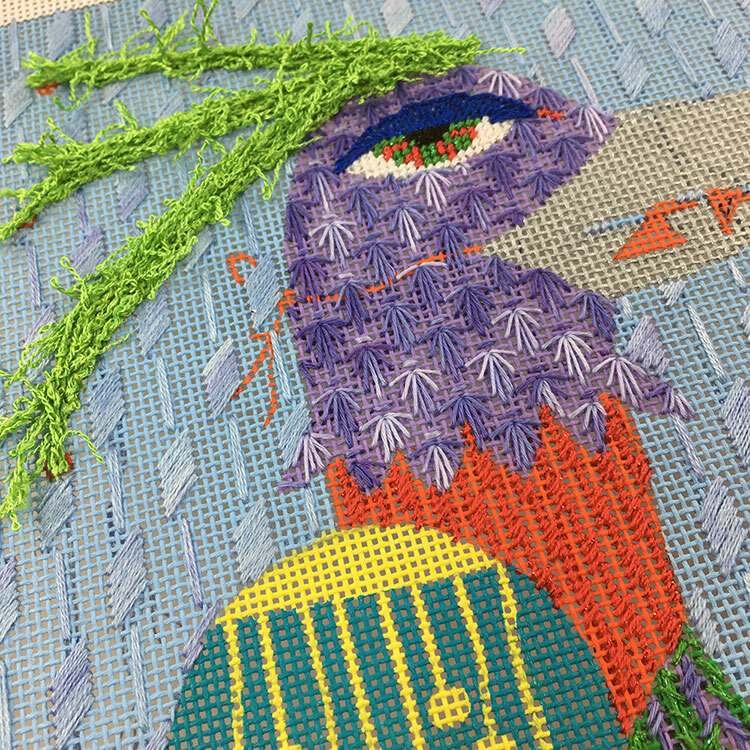 The bird’s rock is firmly in the water which is starting to sparkle with Petite Silk Lamé Braid and a scallop stitch. Last but not least, we stitched the birds toes as bullions. They are good strong toes. LOL. Thanks for visiting. More on this bird soon. If you would like to stitch our Tall Bird on a Rock, here’s the link. Or give us a call at 410.296.0405. « Previous Mystery Post: Background First! 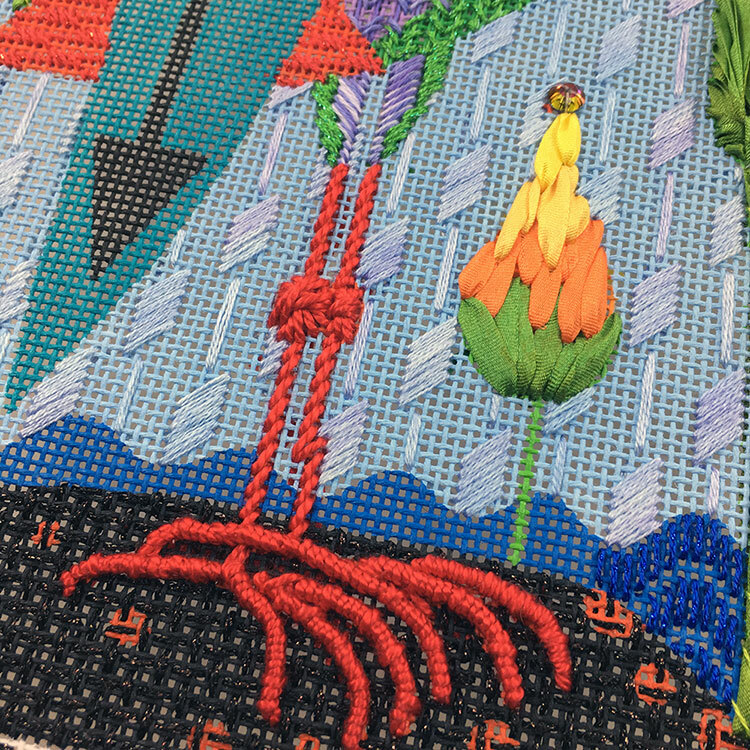 Ruth, in the first close up photo of the background – what are the dark blue lines on the left side under the stitches/canvas? is that the thread path? 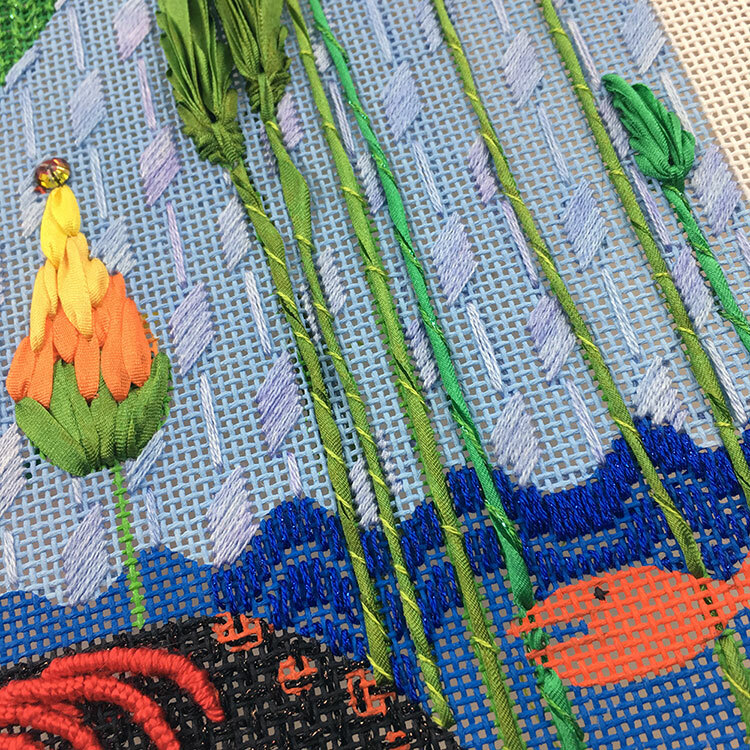 seems too dark..
How do you decide how much open work there can be on a piece and yet enough stitch coverage to have it still look like needlepoint? The definition of looking like needlepoint is open for interpretation. LOL. I really focus on foreground and background and try to make items look like they are where they belong in relation to one another. 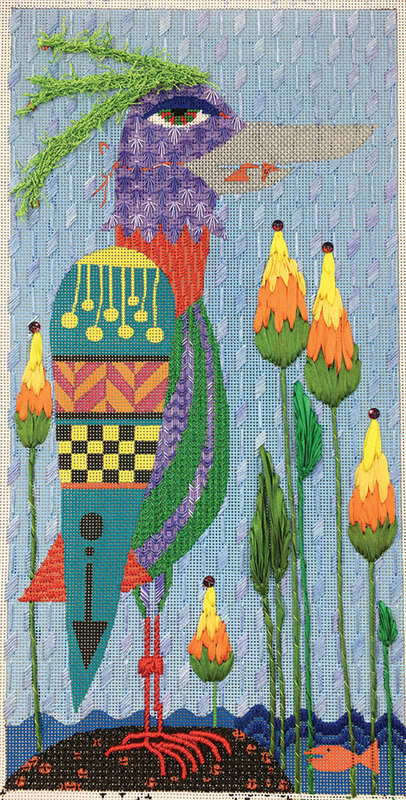 I absolutely love the background stitch — a perfect echo of the shape of the bird! I am looking forward to watching he video on how you made those fantastic leaves! Wish I could be a little fly in your oh so creative brain…. 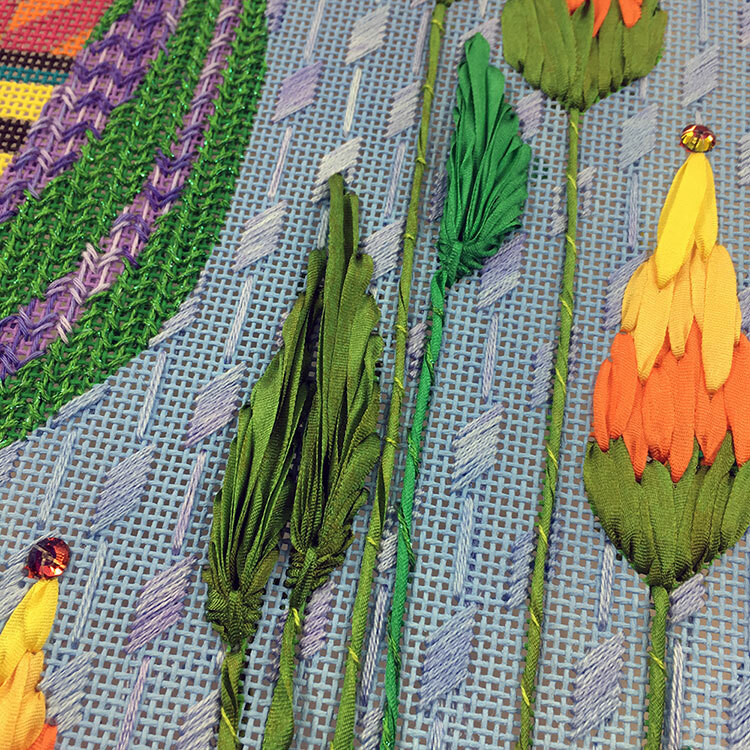 it’s not really something that you can teach — which is why you will forever have to continue making stitch guides for us all!